Astronomers from NASA reported that Hubble Space Telescope took images of possible water plumes erupting from Jupiter’s icy moon Europa. In Hubble’s early work, it has shown that Europa is venting water vapor. Now, a team of scientists from the Space Telescope Science Institute in Baltimore found finger-like projections when they observed Europa as the moon passed in front of Jupiter. The observed plumes are estimated to rise about 125 miles before raining back to the surface of Europa. Previously, researchers have hypothesized that Europa might be the plausible place for life besides the Earth. 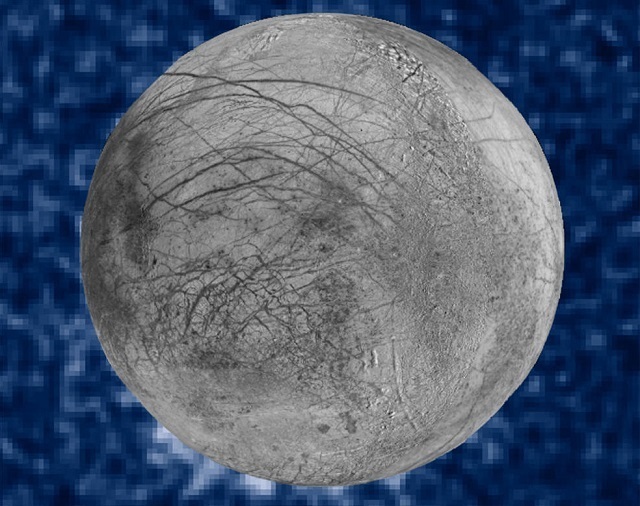 If the venting plumes originate in a subsurface ocean, they may bring deep-sea life to Europa’s surface, which could be captured by the telescope. Furthermore, water plumes on the surface of Europa make it easy to access the chemistry of the ocean without drilling deeply. In the near future, researchers may use infrared vision of the James Webb Space Telescope to confirm the venting plumes on the surface of Europa. Figure legend: This Knowridge.com image is credited to NASA/ESA/W. Sparks (STScI)/USGS Astrogeology Science Center. The image shows that suspected plumes of water vapor was erupting at the 7 o’clock position off the limb of Jupiter’s moon Europa.